Harvard University Press, 9780674059955, 352pp. The U.S. Constitution opens by proclaiming the sovereignty of all citizens: "We the People." Robert Tsai's gripping history of alternative constitutions invites readers into the circle of those who have rejected this ringing assertion--the defiant groups that refused to accept the Constitution's definition of who "the people" are and how their authority should be exercised. 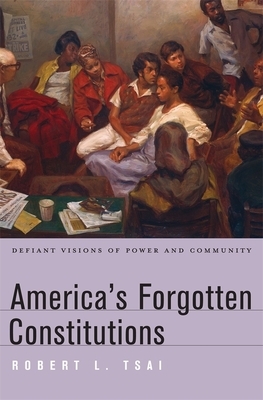 America's Forgotten Constitutions is the story of America as told by dissenters: squatters, Native Americans, abolitionists, socialists, internationalists, and racial nationalists. Beginning in the nineteenth century, Tsai chronicles eight episodes in which discontented citizens took the extraordinary step of drafting a new constitution. He examines the alternative Americas envisioned by John Brown (who dreamed of a republic purged of slavery), Robert Barnwell Rhett (the Confederate "father of secession"), and Etienne Cabet (a French socialist who founded a utopian society in Illinois). Other dreamers include the University of Chicago academics who created a world constitution for the nuclear age; the Republic of New Afrika, which demanded a separate country carved from the Deep South; and the contemporary Aryan movement, which plans to liberate America from multiculturalism and feminism. Countering those who treat constitutional law as a single tradition, Tsai argues that the ratification of the Constitution did not quell debate but kindled further conflicts over basic questions of power and community. He explains how the tradition mutated over time, inspiring generations and disrupting the best-laid plans for simplicity and order. Idealists on both the left and right will benefit from reading these cautionary tales.